Back in March we posted Interface’s ‘Live at Environ’ recorded in 1977. 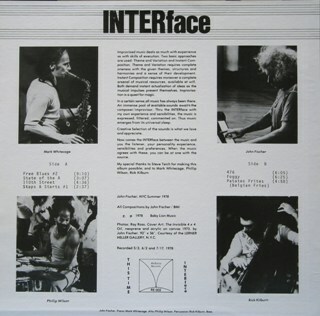 This is the follow up album from Interface [or INTERface as John Fischer would have it], with this stripped-down quartet lineup - the most minimal of INTERface groups - consisting of just John Fischer, Mark Whitecage, Rick Kilburn and Phillip Wilson. As the founder and manager of the Environ loft performance space, Fischer had an important role, not just in his own improvising group [he is the leader and primary composer of INTERface] – but also more broadly in the ‘loft-jazz’ scene in 1970’s New York. Environ does not seem to get the modern-day press that other seminal NYC 1970s ‘loft’ venues do – like Sam Rivers’ Studio Rivbea, Rashied Ali’s Ali’s Alley, The Brook or Joe Lee Wilson’s Ladies Fort. This may be due to the lower profile of John Fischer as musician and proprietor – but Environ was a vital, and a major part of the ‘loft jazz scene’ in mid to late 70’s New York. Started by Fischer as a multi-discipline arts space, Environ presented modern dance, poetry, and was an art gallery as well. Fischer himself was, and is, a visual artist – with both painting and multimedia work. The cover of this LP is a Fischer painting. In later years, he became very involved in video, multi-media, and computer art. His bread sculptures and ‘electronic paintings’ have attracted attention and a book of Fischer’s poetry ‘Love Condition’ was published in 2010. The first lofts to open were Studio Rivbea (Rivers lived there from 1970, and held his first major music exposition there in 1972) – and Studio We, founded by James Duboise and Juma Sultan. [See Sultan’s new Aboriginal Music Society box set on Eremite for more information and music from Studio We. Fischer, moving in both art crowds and experimental jazz music circles, originally had his own Leonard St loft , making music with, amongst others, Perry Robinson (clarinet), Mario Pavone (bass), Jay Clayton (vocalist) and Laurence Cook (drums). Robinson hooked him up with 2 brothers that were happy to sub-lease a large part of their very capacious loft premises at 476 Broadway in Manhattan. The brothers were Chris and Danny Brubeck, sons of Dave. Perhaps not the hippest names as far as experimental arts were concerned but - already interested in establishing a music and meditation temple - they were keen to collaborate with Fischer in his performance space ideas . Fischer spent a few months renovating the 600 square metre loft and opened Environ with a first music concert in July 1975. Environ was on the 11th floor at 476 Broadway, and reportedly offered a purposely spare even minimal performance experience. Audiences would sit on rugs or on the floor and were encouraged to focus solely on the performance. Unlike venues like Ali’s Alley or Ladies’ Fort which were licensed nightclubs and sold liquor, Environ didn’t have a bar – the cash register, calls for drinks and general buzz around the bar being seen as detrimental to the performance experience. Although cider and wine were often available all the same apparently, for refreshment of its patrons. The fact that the very first 1975 performance was one by the great free/time drummer Andrew Cyrille gives a pretty clear indication that the new loft space was going to be programming more adventurous fare than Blue Rondo a La Loft or Take Ten. Fischer was white, and interested in classical music and new, freer ideas of improvisational music, as well as having his own structural and process oriented concepts. This all comes out to some extent in the music of INTERface. But Environ, the loft – was far more wide ranging in terms of the music and musicians that appeared there – particularly in its heyday, from 1976 to 1979. 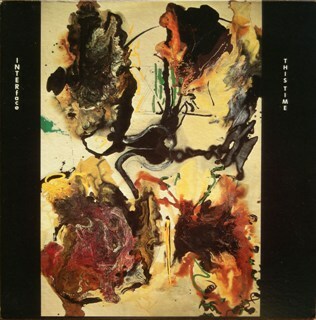 Lester Bowie, Anthony Braxton, Hamiett Bluiett, Roscoe Mitchell , Arthur Blythe, Steve Lacy, Gunter Hampel, Charles Tyler, Peter Brötzmann, Marion Brown, Malachi Favors, Leroy Jenkins, David Murray, Irene Schweizer, Joseph Jarman, Olu Dara, Peter Kowald, Henry Threadgill, Amina Claudine Myers, Andrea Centazzo, Fred Hopkins, Jeanne Lee, Phillip Wilson, Julius Hemphill, Don Moye , Oliver Lake, Air, Billy Bang, Charles "Bobo" Shaw, Chico Freeman, Steve McCall, Muhal Richard Abrams. Muhal Richard Abrams had moved from Chicago to New York in 1976. A few AACM members, like Kalaparusha (1974) had done the same thing earlier – but by 1978, the trickle had become a flood, and a huge swathe of the AACM had transplanted to NYC. Abrams reportedly dropped in one day to Environ and asked if he could try the piano. Liking the instrument enough to return regularly for daytime practice sessions, the word quickly spread amongst his ex-Chicago confreres and acolytes about this performance space with a relaxed but attentive focus on the performers – that also had a good piano. The Environ piano was evidently a source of some pride – and not without it’s own biographical narrative. Practiced on by Abrams, partially broken by von Schlippenbach, and replaced entirely courtesy of D Brubeck, when Fischer mounted a “buy Environ a new piano” benefit , and Dave was prevailed upon to play a gig there to raise the required funds. Unlike many of the ‘new jazz’ concerts, which would get wildly ranging audience numbers – from a couple of hundred to as few as 3 or 4 people turning up for artists like Joseph Bowie or Hamiett Bluiett – the Brubeck benefit gig packed them to the rafters, with people spilling out of the loft space and down onto the stairway below. The new piano was duly purchased. Environ was one of the ‘loft for rent’ venues – and not a ‘hiring live club’, or free performance space. This may be worth mentioning lest people get the impression that the whole loft experience was a warm fuzzy exercise in communal socialism. That being said, the aim was anything but exploitative – typically an artist or group would be asked to stump up something like the cost of 1 day’s real rental (1/30th of a months’ rent in other words) , and accept an understanding that the loft would take door receipts up to a certain value – maybe $150 or so – and then split anything over and above that between loft and artist. Easy to see that a big-crowd night could easily satisfy artists financially – and that only a small audience turning up meant that the artists were 'paying for playing'. If anyone is interested [extremely unlikely I realise] I will add some more to this 70s loft-related stuff here. .. This record is worth hearing – Fischer is interesting and sometimes inspired, Phillip Wilson is a spare, fleeting texturalist on this album, and Rick Kilburn a really strong player. Mark Whitecage makes it though. He’s great here, and this is nowhere near his best work. 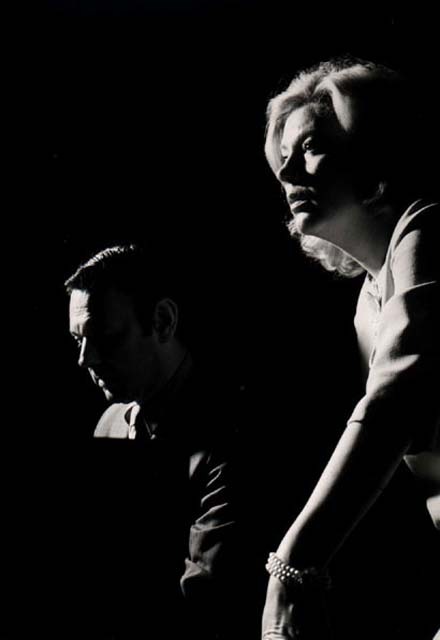 I cannot urge you too strongly to buy some recordings from either of these musicians - Whitecage's own are all limited-press runs and Fischer's now all unavailable commercially. There are a number of Whitecage releases available on C.I.M.P. records. They are in print and available at their website and at Downtown Music Gallery in New York City. I know they have a bunch in their used section as well as many new copies. I checked I-tunes and there are many very good releases from Whitecage available there and emusic has some as well. So if you want hear more it should not be a problem. Thanks for posting this truly rare recording. Jazzloft has 'em, and DTMG. 'Ducks on Acid' looks good. Mark Whitecage and Philip Wilson together! Irresistible. John Fischer on Facebook - he's active - posted about his recent gig in cafe vivaldi, and his videos feature his music as well. EXCELLENT to know - many thanks Sean. Have you a link for his Facebook profile? I ain't on it and I got lost whilst searching between the Christian musician J Fischer, and the many other Fischers that are out there.. I've known John since I was a little kid. He was the star of parties I went to with my beatnik parents in the 60's. About 15 years ago I started intermittently working with him, on website, some of the animation projects etc. We're good friends. He asked at the last moment to cover his last gig, and I made a quite decent sound recording (which has been loosely mastered), took a bunch of photos, and shot this one random track on the DSLR video (synced with better sound). Wanted to just hang and enjoy as well! He was actually quite moved to find people talking about his recordings, since his gig mailing list is a pretty insular group. I'd like to share his writing to me after he looked through your posts. Importantly, one of the essences is about the cooperative non-profit mindset the environ loft had. Sharing of these oop releases in your respectful context is cool. In fact, we don't have digital versions of these recordings. With megaupload down for the count, it would be great to revive them. It appears they were only live for a moment. Thanks for sharing the story of Environ - I didn't know its history.